GAZA, Dec. 21 (Xinhua) -- At least three Palestinians were killed and more than 40 injured on Friday during clashes between Palestinian protesters and Israeli soldiers stationed on the border between eastern Gaza Strip and Israel, medics said. 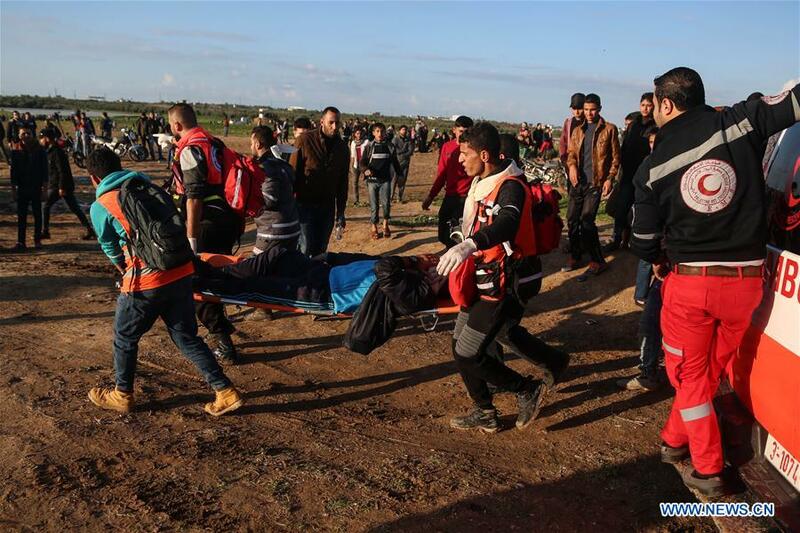 Ashraf al-Qedra, Health Ministry spokesman in Gaza, told reporters that Mohamed Jahjouh, 16 years old, Atteya Yassin, 40, and Abdil Aziz Abu Sharee'a, 28, were all shot dead by Israeli troops' gunfire during the protests in eastern Gaza Strip. He said 40 more were shot and wounded by Israeli soldiers' gunfire during the "peaceful protests and rallies" close to the fence of the border between eastern Gaza Strip and Israel. "Among the injuries, there were four paramedics and two local photo journalists," said al-Qedra, who accused the Israeli soldiers of using live gunshots aiming to kill and seriously wound demonstrators. He added that since the start of the "Great March of Return" on March 30, the Israeli army has shot and killed 242 Palestinians and wounded more than 25,000 others. Around 40 percent of them were shot by live gunshots fired by the Israeli soldiers. Khalil al-Hayya, deputy Hamas chief in the coastal enclave, told reporters as he joined the protests on Friday that the weekly protests and rallies will go on until Israel ends its 12-year blockade on the Gaza Strip.